Today I woke to a frosty morning but the sky is oh so blue, just like my nails! 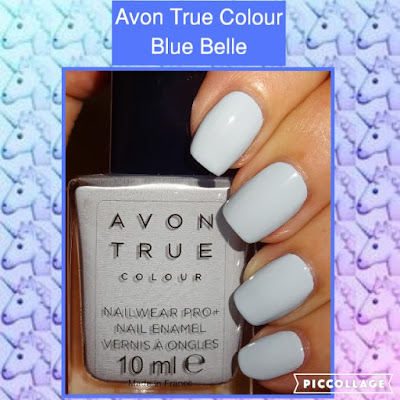 I can't wait to share with you Blue Belle from the Avon True Colour range, such a pretty shade. The loveliest palest blue, a cool shade, great to team up with jeans and a crisp white shirt. The polish glided onto my nails, it has a non-streaky formulation and good brush. Two coats for full coverage and my photos are without top coat, however, I later applied top coat for durability.